Tattoos for Now is Vancouver’s largest airbrush tattoo company and our artists are the best in the business. If you are planning an event and are looking for a fun idea or activity to add, consider hiring Tattoos for Now. 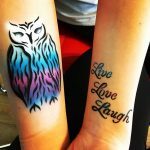 Tattoos for Now is proud of the reputation we have created for ourselves over the last thirteen years. We are known for our professionalism and our dedication to our customers. Our seasoned team of artists arrives at all events promptly, prepared, and committed to its success. Whether they are a three year old child or a 55 year old Corporate Executive, your guests will always receive the same courteous and attentive service. A great event depends on the enjoyment of its guests and Tattoos for Now helps our clients make this happen – one experience at a time.